A recent study found that parents and kids consumed fewer calories at fast food restaurants when the menus included nutritional and caloric information. 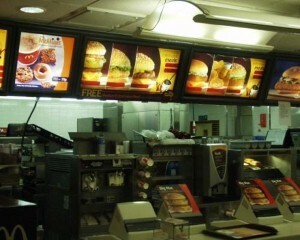 Researchers in Seattle surveyed 99 parents of children between the ages of 3 and 6 about their fast food dining habits. When presented with a sample menu and asked what they would order, the parents who were shown menus that included calorie information chose 102 fewer calories on average for their children, compared with the group who did not have access to calorie information on their menus. "Just an extra 100 calories per day may equate to about 10 pounds of weight gain per year," said the study’s lead author Dr. Pooja Tandon. Among the other things fathers can do to help their kids battle the fast food bulge are cutting down on restaurant meals in general, as well as choosing small sized items and avoiding things that are labeled crispy or are deep fried. Experts say avoiding calorie-packed add-ons like cheese, bacon and extra sauces may also help cut calories. Remember that moderation is key to maintaining a healthy diet. If your family is planning on eating out, you should encourage healthy eating the rest of the day while still aiming for healthy options at the restaurant.